There’s a lot of meat on this reputation story, so Erin and I will cook it up fresh and help you digest the tasty and not so tasty ingredients to IHOP’s rebrand to IHOb. IHOP revealed its new brand. Was it a reputation win or loss? Tune in to find out! If you have a question you would like us to tackle, please leave a comment below or on my Facebook Page. Andy Beal: Welcome back, and we’re gonna serve up a hot and pressed story this week. In fact, it’s the house special, because we’re gonna talk about IHOP, which as you may know, stands for International House of Pancakes. Andy Beal: Except that, they recently announced a change to the brand and they’re gonna be called IHOB, with a B, because they’re gonna be the International House of Burgers, which is kind of strange, and just kind of fill in the backstory a little bit. Andy Beal: They first teased about the name change back at the beginning of June, and they showed the new logo, so this is kind of interesting, because it got fans and the media trying to guess why they were going to change from a P to a B, and there’s all kinds of speculation and discussion. And then on June 11th, they announced what the answer was, and that was they were gonna change their name to International House of Burgers. Andy Beal: And they’ve announced seven new steak burgers, including the quote, unquote, Mega Monster, which apparently is really to compete with McDonald’s Big Mac, so they’ve announced these burgers are the highlight of their menu. Andy Beal: And perhaps the reason they’ve done this is that, records show, and numbers show, that their sales have been down around 2 percent, and so maybe they’re just trying to add a new revenue stream because, maybe, the revenue from their pancakes is kind of flat. Andy Beal: Okay, that was a bad joke. Okay, moving on. Andy Beal: But they have hinted that this is gonna be, maybe, temporary, they’re not gonna make this a permanent brand. Maybe just a few weeks, they have not really said for sure. And they do actually still have both Twitter accounts, so it looks like they’ll eventually switch back. Andy Beal: But in the meantime, well, social media has gone absolutely crazy, hasn’t it Erin? Speaker 4: It has absolutely gone, absolutely crazy. I have seen some incredibly amusing tweets. You know, hearing that this is a brilliant marketing campaign, I’m still not positive, you know? I think brilliant marketing is if it sells hamburgers, which seems to be their ultimate goal, so I think it still has yet to be seen. Speaker 4: I think they’re gonna sell more pancakes from this, but I don’t know that I would be going to IHOP for a burger. Andy Beal: Yeah, it’s interesting. Well, to be honest with you, I don’t know if I would go to IHOP for a pancake. I’ve only maybe been there once in the last 10, 15 years. So, it’s interesting that, you know, this has really helped them to build up some buzz, even just the teasing of the new name got people talking about them. Andy Beal: And it makes you wonder, how many people are gonna head out there to check out these hamburgers? Because, you know, there may be a lot of people that don’t even consider going out there for a pancake, and yet you got their competitors that are in the burger space, just kind of teasing them a little bit. Andy Beal: Wendy’s tweeted, “Remember when you were like seven and thought that changing your name to Thunder Bear Sword would be super cool? Like that, our cheeseburgers are still better.” And then Burger King even went as far as changing their name to Pancake King, which was hilarious. Speaker 4: It was, and I loved the Wendy’s tweet that said, “We’re not really afraid of the burgers from a place that decided pancakes were too hard.” You know, Wendy’s social media is fantastic. I know we’ve discussed that in the past, but they’ve really, really been the real MVP here. Andy Beal: You know, it’s interesting, though. I did a little bit of digging around, ’cause I was curious. I’m like, well, you know, you’ve got, Wendy’s, Burger King, Waffle House said they’re not gonna change, Whataburger said we’re never changing our name to “Whatapancake”. So, I kinda dug around their menus, and you know, Burger King offers pancakes at breakfast. Andy Beal: And Wendy’s doesn’t offer pancakes currently right now, at least, not in the US, but overseas, you can get these really kind of, lame looking pancakes that I wouldn’t spend money on, so it’s kind of interesting that they’re teasing IHOP and saying, you know, you shouldn’t be in the burger business, when they dipped their toe in the breakfast business. Andy Beal: So it’s kind of, I don’t know, I think that they’re mostly just trying to jump on this bandwagon and get a little bit of the publicity that IHOP’s picking up from this. Speaker 4: I agree, and, you know, the words are coming from the far corners of the internet. This has really perked up people all over the place, mostly at IHOP’s expense, but I would really be surprised if just the awareness didn’t increase their pancake sales, if nothing else. Andy Beal: Yeah, I mean, I’ve looked back, at the different campaigns. Things that we’ve talked about. So, if we pull out brands like McDonald’s, Superbowl commercials, Burger King, Wendy’s, is really good at being tongue and cheek. Andy Beal: Even negative stories, things like that, there’s a lot of buzz. Lot of discussion that goes on out there, but my first, and immediate reaction to all of this was, like, how often do we hear about IHOP? I mean, you know, when I was doing my research and I saw that Waffle House kind of chimed in and said that they know their roots, I’m like, oh yeah, there’s a Waffle House, too. You never hear about them. Andy Beal: So hear about how much buzz this is creating for them. It kind of reminds me a little bit of when Kmart did their campaign, many years ago, called Ship my Pants, and it went viral. Great videos, that created a lot of buzz. Andy Beal: But then the speculation was, well how much is this gonna actually help them to increase their revenue? And there’s been, a number of them have been like that, but you still gotta think this is gonna bring awareness, maybe even help them build a brand. Andy Beal: ‘Cause I have never seen a memorable IHOP commercial. I know they do the ones with, like, their featured flavors of the month, and those sometimes make me drool a little bit, but they’re even running TV campaigns right now, to push this branding change, and to kind of, like, promote their burgers. Andy Beal: So they’ve really stepped up that brand awareness, and we don’t know if that’s gonna transpire into more revenue, and increase sales, but I’m not seeing anything too negative from this. I mean, there is a little bit of negative sentiment out there. Speaker 4: There is, and you know, I think that, this may be a little bit out of touch with, I don’t know if I wanna say current culture or popularity. I feel like they kind of missed the mark by really focusing on burgers. Speaker 4: If they had turned to International House of Bacon, I feel like, their target market, which I don’t know where you are, but you see a lot of college students, they’re late at night having pancakes, or very, very early in the morning. I feel like bacon would have been a great thing to capitalize on, because, you mentioned earlier that they’re trying to compete with the Big Mac. Speaker 4: Like, their biggest burger is competing with the Big Mac, I feel like they could have aimed higher there. Andy Beal: Yeah, and I think you’re right. Is it really a good product to focus on? I mean, just about everywhere you go sells hamburgers. I mean, it’s not like you’ve come with, a particular product that is gonna set you apart. Andy Beal: You are now trying to compete with the burger chains that only focus on that, and maybe, create really tasty hamburgers, but you know, yeah, you can go to TGI Fridays, you can go to Applebee’s, you can get a pretty good hamburger there, too. So, what’s really helping you here? Andy Beal: That’s definitely a valid criticism. But, I think that you’re right. I think they could have gone with bacon. Heck, they could have gone with avocado, I don’t know. They could have gone with something that would have set them apart and they still, I think, did a really good job of putting the teaser out there, changing the brand, getting the publicity, kind of putting a little dig in the ribs of these burger chains that have now made them the focus on their attention. Andy Beal: And I think that’s all building into some good hype for them. And I know that you were kind of on the fence, but I’m kind of feeling this is a winner in terms of reputation wise. Speaker 4: I like it. I just am not sure if the overall sentiment is positive, or if it’s positively mocking them. You know, I’m going back and forth a little bit. I would like to see, in two months, what has happened with their sales over the last year. You know, that’s gonna really sell me. Speaker 4: I think that it’s fun, I think that it was a great plan, I just think they could have done better. Andy Beal: Okay, yeah. So, I’ve kind of split it up between, I’ve got some bullet points here I’m gonna kind of talk through. I’m a fan of this, I think it’s a big winner. Andy Beal: So I’ve got a big list of things that I think they’re gonna get from this that are positive, but I have pulled out a handful of negatives from this. So let’s start with the positives. Let me just go through this list and then we’ll, kind of, get your thoughts on it. Andy Beal: So why do I think that this is a reputation winner? First of all, they did a great job with the teaser. So, not only did that build speculation, but it got feedback for them. Because, everybody was guessing and giving them answers, and tweeting to them about what that B could stand with them. Andy Beal: And just as you highlighted bacon, they probably got a ton of insights from their fans, as to what they might hope to get. Now, think about how that could then trigger a future campaign. If a lot of people did ask for bacon, and they didn’t get it, because IHOP already committed to burgers, than maybe a future campaign could be surrounding bacon. Andy Beal: So they’ve kind of gotten some free research there. Andy Beal: Well, bear with me. I’ll go through these and then you can make notes and tell me what you agree or disagree with. Andy Beal: Okay, so the launch, wasn’t just on social media. So they’ve changed their name, they changed the logo, and they’re running TV ads. So, this is, was, some brands just do a social media campaign, and it’s limited to that buzz that you and I see a lot of because we’re on social media a lot. Andy Beal: But IHOP has gone to different channels as well. Now, number three on my list. Facebook does show that this is mixed sentiment. And we’ve talked about, you know, a lot of criticism. And if you look at their initial announcement, I went to Facebook, ’cause Facebook is one of the few places where you can actually look at the emoji icons, get an idea of what people actually think as opposed to just hitting like. Andy Beal: So, the initial announcement on Facebook was mostly negative. But, if you look at the reactions to their cover photo, which is the new logo. I’m sorry, the cover photo is just burgers, and then the profile photo shows the new logo. Andy Beal: You actually can see that it’s mostly likes, and mostly positive, maybe laughing, but it’s not as much negative that shows up there. Andy Beal: Alright, number four. Everyone is talking about this now. Most of it is sarcasm, but it’s also generally light hearted criticism. It’s not a big reputation crisis for them, it’s not like they’re now putting out fires. There’s a lot of ribbing going on, and a lot of sarcasm, but overall, it’s either tongue in cheek or it’s positive, but it’s not really like crushing their reputation. Andy Beal: Number five. Now, this one is kind of interesting because I do a lot of focus on Google reputation management. And, think about all these stories that are gonna flood Google. And this is actually gonna insulate IHOP, should they ever actually have a reputation crisis. Because now, their search results on Google are gonna be flooded with this kind of story, and compared to, maybe a salmonella breakout, this kind of story being dominate in the social results is actually gonna be a lot better than some other major crisis that could show in the future. Andy Beal: And, lastly, they’ll get to see if new customers are actually interested in tasting the burgers, and we already speculated. Are people actually gonna go there to try the burgers? Are people even gonna think to themselves, you know what? I like their pancakes, I’m gonna head over there. Andy Beal: So, that’s my list of why I think this is a winner. Anything jump out at you? Anything you disagree with? Speaker 4: First of all, I love the list. And I like the secondary perspective you took, because I definitely hadn’t considered the insulation against future attacks, and I think that’s brilliant, and I hope that they considered that too. You know, we may never know. I think that, there are gonna be a few things riding on the success of this. Speaker 4: First of all, if they set expectations accordingly. You know, if people are going in expecting an IHOP burger, and they get an IHOP burger, than I think they’ll be in good shape. But if they’re going in expecting a over the top, gourmet, experience, you know, that’s not gonna happen. Speaker 4: Saying that McDonald’s is their main competition, expectations seem to be set accordingly. So, really, I think, I saw a post on Facebook yesterday that said, they need to stay in their lane, and I think that, even changing food, as long as they continue to maintain expectations for what level dining experience they are, that I do think they will be in pretty good shape. Speaker 4: My children love IHOP, I have two young kids, and they think that going to IHOP for pancakes is super exciting and fun, so will I order a burger next time we go? Not likely, but it will keep them top of mind, and I think that, that, with school being out and it being summer, that that’s a good place to be. Andy Beal: Yeah. Now, you make an interesting point about the burgers and stuff, because that leads, let me roll into my, I have three point for why this is not a good idea, or why this could hurt them. And one is, there’s not really much of an incentive for going to try the burgers now. Andy Beal: So, like you said, comparing yourself to a Big Mac. Now, Big Macs are tasty, but they’re not the most gourmet, delicious burger you’ve ever had, so you’re not really creating an incentive to go try these burgers. Andy Beal: And, I would have thought, as well, that they would have set, maybe a shorter timeline for this branding change. Because, we don’t know when it’s gonna end, so I would have said, hey, this is two weeks only. We’re gonna be the IHOB, and if you come in and get a hamburger, you’re gonna get this, this, and this, or we’re also gonna throw in a free dessert. Andy Beal: I think they’re doing unlimited fries, so there’s something there, but there’s just no reason to go in and try this right now. And, why would they try it later? Why would somebody wait for later? So, I don’t know if this is really creating an urgency or much of an incentive to go in and try them. Andy Beal: I also noticed that they have not secured the domain name IHOB.com. It actually goes to some holding page owned by somebody else. And if you’re going to use a brand for a campaign, you have to register that. Now, you may not remember this, I know Erin will probably remember this, but listeners won’t. Andy Beal: So, I own the software company, Tracker, and few years ago, we did a Halloween promotion, and we actually had Trackula. And, T-R-A-C-K-U-L-A. So, I had this hand puppet that looked like a Muppet, and we did this little campaign, we did videos. Andy Beal: I even had the domain name, I had the Twitter account, we changed the logo. So, IHOP has done some of that, but I would’ve thought, if you’re gonna do a new brand, at least get the domain name and redirect it so that people are like really convinced that you’re putting an effort into this. Andy Beal: Yeah, go ahead. Speaker 4: Oh, no, I was just gonna piggy back off that and say, you know, they started out with really, really good congruence between channels, and then just kind of fell off right there. Andy Beal: Yeah, and we’re big fans of congruence, if you look back at our episodes, we talked about that. Andy Beal: Lastly, they did get a lot of buzz from this. I don’t know how much of it’s gonna stick, but they also shared a lot of this buzz. It’s really, if you look at this, the buzz is circulating the burger industry in general. So, yeah, IHOP is getting a little bit of biz by doing this branding, but Wendy’s is jumping out as being the hot and fresh burgers, and Burger King is kind of chiming in and tongue in cheek, so this is kind of helping the entire burger industry, and it makes you wonder that, when people look at this and they start craving a burger, they may, as we already said, probably not gonna be an IHOP burger. Andy Beal: They’re gonna go to a particular restaurant. Here in Raleigh, it’s a char grill burger. I mean, if you are in the triangle, or if you ever visit Raleigh, give me a call. I will take you to Char Grill and let you decide for yourself if this is a better burger than what IHOP is offering. Speaker 4: I love it, and I feel the same way. I do like the positive energy that’s come from this, it’s been a really nice distraction from some of the more depressing news, you know? The news cycle lately has been a little bit redundant and just not very uplifting, so if nothing else comes from this, it’s been really fun. Speaker 4: But I agree with you, there is nothing better than a small, local burger joint, if you want a good, even fast food burger. Andy Beal: Yeah, we’ll leave that on the note that, hey, even small businesses can have a better reputation than these large, multi million dollar companies. So hopefully you’ve got some tips from this for any campaigns that you wanna do, but also know that, hey, being a small, local burger joint is probably the way to go, and you’re probably still gonna do a lot more business than this IHOB is. Andy Beal: And we’ll see how long it takes them to change back. So, thanks for tuning in. Hopefully you appreciated that. If you have any questions or any feedback, please go to our Facebook page, /andybealorm, or just go to andybeal.com, find the post for this podcast episode, and just leave us a comment, we’d love to hear from you. Andy Beal: Maybe give your thoughts on, well, maybe you’ve even tried the burger and you can tell us what you think of it. Erin, I don’t know about you, but, I’m not in a rush to go to IHOP to get a burger, but I appreciate you chiming in and joining me this week. Speaker 4: I feel the same way. Thank you so much for having me. Andy Beal: And we appreciate you guys listening, we hope you’ll join us again nice time. Thanks a lot, and bye-bye. 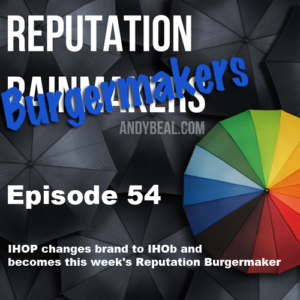 Share the post "#54 – IHOP changes brand to IHOb and becomes this week’s Reputation Burgermaker (see what we did there?)"